The website referred to as www.kitchenaidrepaircenter.com is run by Master Appliance Repair – professional appliance repair company. This inquiry quote fee, which takes place when the inquiry is made by the phone, includes the amount to examine and diagnose the issue with any of the appliances in question, on the basis of what appears to be the problem with the appliance, and then to give a projected cost, if it becomes necessary, to initiate the repair and fix the problem. An additional amount of money will be incurred for every fixture that is looked at and in which we diagnose the problem. This amount of money is not able to be returned to the customer, and needs to be collected before the estimate. Appointments – there is a time frame of 2 hours by which one should expect to be serviced. We make these appointments based on when we are available. If we don’t have parts for your repair, we won’t schedule an appointment. Diagnosis – Depending on what we are told by the customer to be the problem, one of our Master Appliance Repair Servicemen will work on the appliance. However, we will need unrestricted access to the device. If we are not given full access, then we may need to charge more. Some devices are very complex, and although things may seem to be working, there may also be problems that develop. If this happens, and other problems arise, we will conduct an estimate free of charge. If our serviceman gets to your location and the device starts working again, we will refer to it as having “no problem found”. However, the person who calls us for the repair is responsible to pay us our service costs – $50.00. If the problem is caused by something that is outside of the appliance, we may recommend that you call someone who specializes in that particular field. If that’s the case, the customer is responsible for all costs. Recommendations – Any advice that we give you is just a suggestion, and should be treated as such. You are responsible for your own decisions. Estimate – We will give you an idea of what we think it will cost for you to repair your appliance, and the offer remains good for 7 days. You are responsible for examining this estimate before you give it your signature. When you sign, it means that you say we can work on your appliance for the estimate given. Sometimes we will need to take a bit longer for our estimate, and will get back to you within 48 hours if that is the case. Sometimes the price for our supplies changes, and we may need to give you a different quote. In that case, we will revise it. We will need you to put some money down before the repair is made. Repair Cost – As far as our prices go, they only apply to Master Appliance Repair. We are under regulation by the MASPG, which is The Major Appliance Service National Price Guide, and because of this we charge by the job, and not by the hour. Keep in mind if there is a returned check you will need to pay us $25. Parts – We usually have the parts we will need to make the most common repairs with us. Sometimes we won’t have the parts needed, and will have to order them. Most of these orders are initiated with 1 to three days of the time they become apparent. They usually take anywhere from 1 to 5 days to get here. We’ll tell you when we get the part. If we take any old parts off of your appliance, we will keep them if need be, if they are part of the repair. If we order a part and it is no longer available, we will not do the repair at all. Maintenance – Sometimes poorly maintained appliances give the impression something is broken. If this is the case, then we will have to charge extra for cleaning the appliance before fixing it. Canceling Our Service – If you cancel, we will need to charge you a 25% restocking fee. These refunds can be as long as 4 weeks for us to get to. We cannot refund special parts that are ordered. Warranty – Master Appliance Repair offers a 3 months warranty on everything. It is good on any parts we put on you appliance that are purchased through us. Our warranty isn’t transferable to other owners, and is only valid if one of our technicians do the work. If you don’t perform proper maintenance, then we will void your warranty. You can’t transfer the machine or its parts, or that will void the warranty as well. The same occurs if the repair has been jeopardized by the user – you will have voided the warranty. We can’t give a warranty for the following items: broken or parts no longer in use, chemical liquids, filters, access valves or any sort of wiring mechanisms. We are not liable for any item or person that is hurt by a malfunction and are not liable if your food goes bad due to lack of refrigeration. If water leaks when we are repairing an item, then we are not responsible for any damage done. If we decide it is best to not offer a warranty, we can make that decision. Fee Disclosure – All Visa Debit Card transactions have a fee of $3.95 for every transaction. Any other card like the one above will be assessed a 3.75% fee and a minimum fee of $3.95. Completed Repair – You need to sign our invoice when we repair your appliance. This shows you have examined and approved of the work done. We don’t give refunds on repairs that are finished. 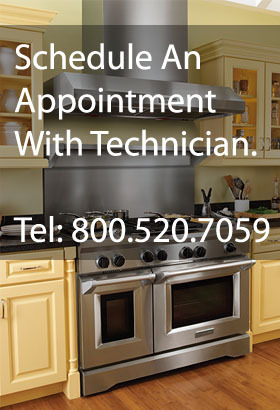 DISCLAIMER: Master Appliance Repair is in not associated with nor affiliated or sponsored by Kitchenaid. These brand name is registered trademarks of the individual parent companies.